6 Sep 07 - New motor & battery test flown. Propeller Graupner CAM 14" x 9½" blades on Aeronaut hub Graupner CAM 10" x 6"
Static motor parameters Never tested 3S 2250mAh 16C LemonRC LiPo gave 8265 rpm at 17.5A at 11.03V. Input power is ~ 200W or 89W/lb. Flight performance Climb is quite good at approximately 30°, but it needs a little speed to get the best climb rate. The Little-Star descends quite slowly and is fairly manoeuvrable despite 'V' tail only control. Vertical climb-out possible whilst maintaining the very good glide character even with the increased weight. 6 Sep 07 - Test flew the model today. The Climb-out can be vertical if you like and at a good speed. Probably the most efficient climb is at around 45°. With smaller, say 1000mAh pack the model weight would be similar to it's previous guise whilst maintaining the current power level. 30 Nov 02 - I decided to fit my Cobalt 400 motor into the Little Star to give it more power. To allow the fitting of the heavier motor, I needed to move the servos further back otherwise it would not be possible to mount the battery far enough back. The servos are now fitted completely behind the wing seat aperture, which made installing them and setting up a little difficult. I've completed the power checks with an Graupner CAM Gear 11" x 8" propeller, which produced reasonable results. I still have to locate the battery after working out it's position to get the correct CofG. 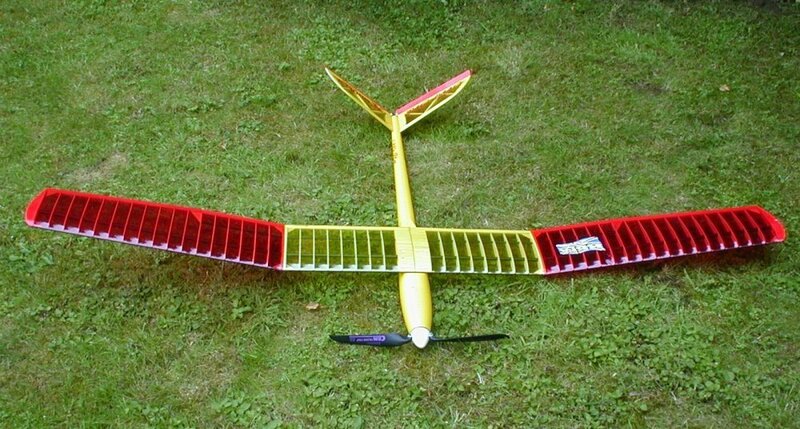 I then intend to fly the model before making any changes to the propeller set-up. 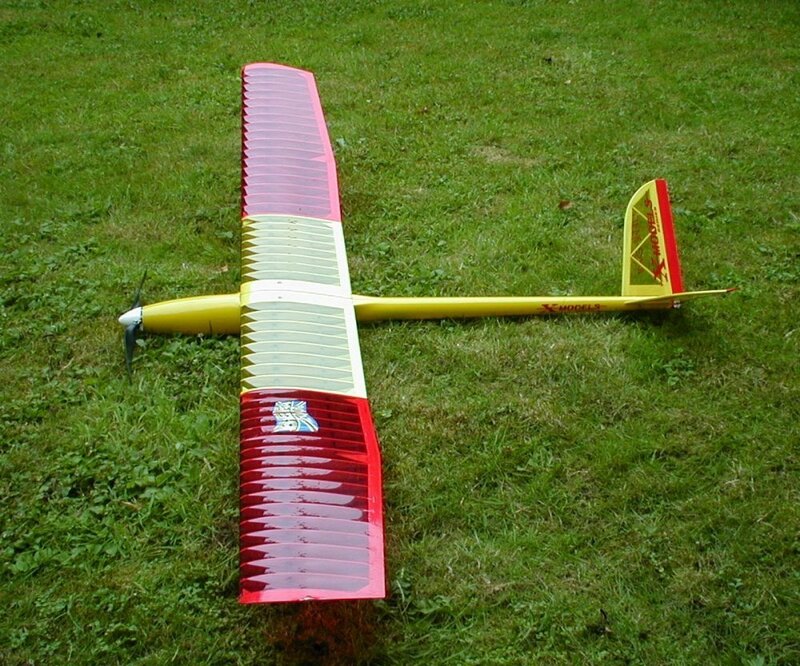 4 Mar 00 - This model was bought to allow me to compete in the E400 competitions run by the British Electric Flight Association. 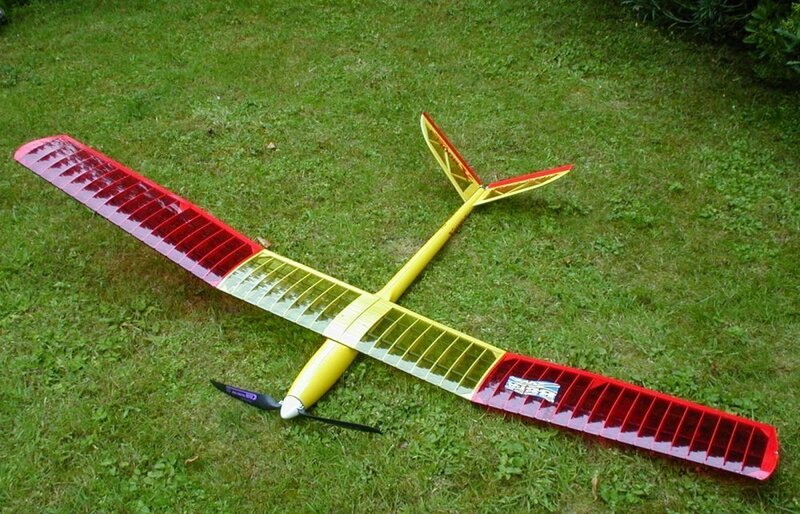 It has a glass-fibre fuselage with built-up wings with carbon tube spars. The wings are supplied built & flight ready, with the only work being installing the power train and radio gear. 12 Mar 00 - The conditions today were nice with bright sun and a light-moderate breeze. It was a little too early in the year and just a tad windy for decent thermals, but I managed to find a some weak lift to prolong the flight. I am still getting used to the 'V' tail only control, and find it a little awkward compared to having ailerons. However, the reduction in weight and drag makes it worth persevering.